Considering I live in Mussoorie, it sounds a bit irrational that I should seek another hilltop to escape to; but there’s something to be said for wanting to get away from it all and I find Ranikhet is the place for me. Here’s why. 1. There aren’t many places on earth I can see the Himalayan range from Bandarpunch in the Garhwal, spanning across Trishul, Nandadevi, Panchaculi, in Kumaon, all the way to Apa Nampa in Nepal. After a good dousing of rain, the clouds settle and the air gets wafer-crisp. That’s when the peaks start revealing themselves. I can’t begin to describe how dramatically the colour of the setting sun sets the ice-cream peaks aflame. Come September, right through February, you can see the whole range, dawn to dusk. Imagine that! It’s reason enough for me! 2. Connectivity is erratic. Which turns out to be a good thing since the idea is to switch off from the everyday onslaught of data. Going to Ranikhet feels like checking into a spa where without paying spa rates. 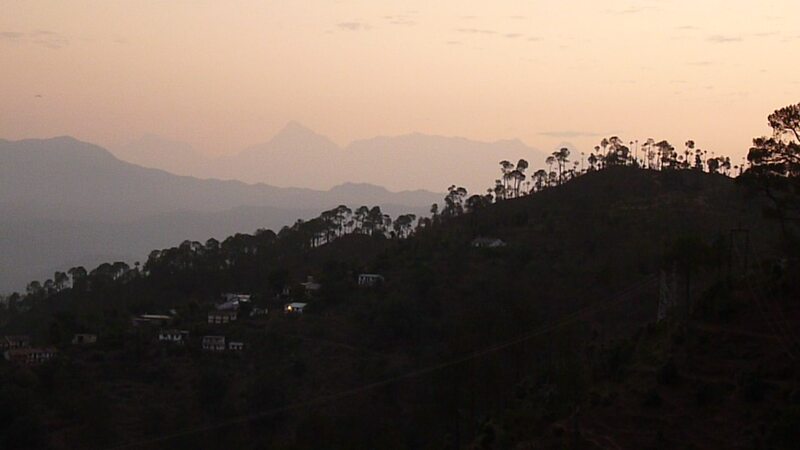 With the exception of my camera, I travel light into Ranikhet and feel better for it when I leave. 3. I can enjoy the simplicity of pastoral scenes that are becoming rarer by the day. I know I’m in Ranikhet when I see women carrying enormous piles of grass on their heads and sickles in their waistband. Or visit smoky tea shops where the tea and ‘fen’ taste better for reasons I can’t quite pin down. I love seeing village girls neatly turned out in school uniforms, their hair plaited with red ribbons, cheerfully walking miles, to school. I enjoy the sound of cowbells as much as I like chatting with locals who treat me like an old friend even time I visit. 4. Wildlife comes to me. I don’t have to pay an arm and a leg to enjoy nature. Jackals, foxes, martens, Sambar, Barking deer and Serows, pheasants and leopard have literally crossed my path. As a nature lover, I can’t help but spew rhetoric about being awakened by the sweet melody of whistling thrushes on my rooftop. Or sipping chai in my garden watching the sunlight bounce off the iridescent head of the Flowerpecker. Or listening to the Francolin clearing his throat before every call. And hearing a carpenter drill only to discover it’s a Yellow-naped woodpecker. Or check out the latest leopard kill on the golf course. And seeing a jackal and a Steppe eagle soaking in the winter sun side by side! 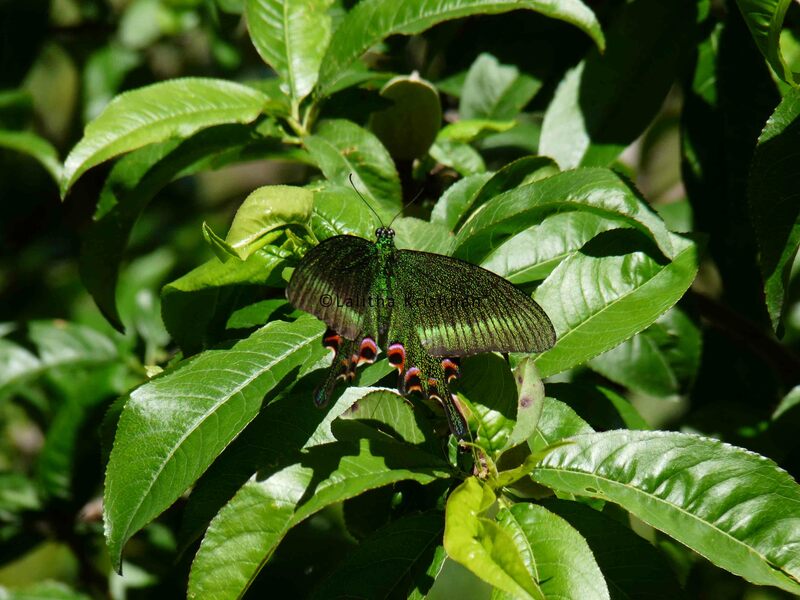 Or following butterflies that look so exotic, it’s a miracle they aren’t extinct. Need I go on? 5. There is no home delivery. No Mc Donalds, Pizza Hut, or Café Coffe Day outlets here as yet. Definitely no malls. And yes, I’m grateful for the “unspoiled ” flavour of the place. There are any number of restaurants and a proper market; so one won’t starve for want of sustenance. For those of us who have homes here, our small soirees end long before city-wallas begin their nightlife. 6. Every house has a fruit tree, flowering pots or a vegetable patch. 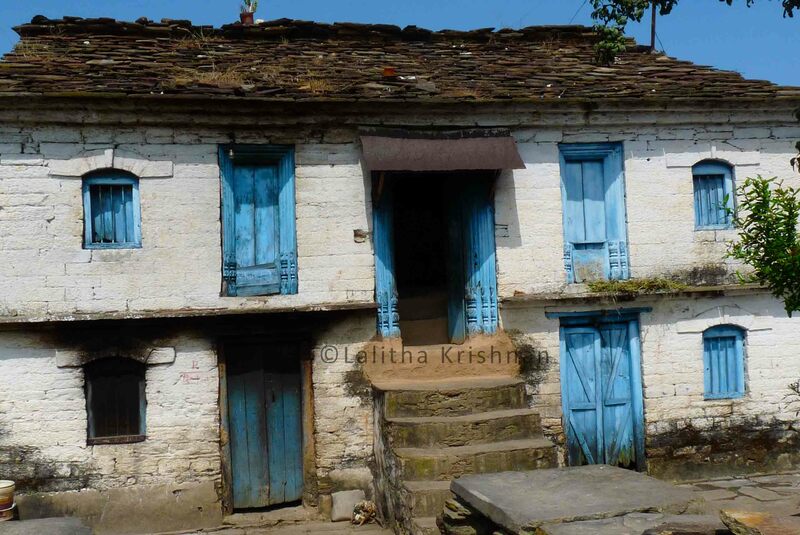 It could be the humble geranium in a rusty tin or the ‘kaddu’ drying on the rooftop; they make Ranikhet homely. 7. Not too many tourists. Funnily enough some of the reasons I love Ranikhet are the reasons why it’s not a popular holiday destination. Lucky for me! Well written. Short and sweet, the pics are beautiful. We love to visit the place sometime, after all what you have narrated. Thanks. What I enjoy about your writing is how lucidly you describe what brings joy to you. A long time ago had visited Ranikhet. In the mid-’80s. It seemed so pristine then. I hear you. Then again, your photographs are stunning. Double delight. 🙂 Thanks for writing and posting.